It's holiday shopping season and BLINQ.com is here to give you the best deals and prices on laptops, tablets, clothing, kitchen appliances and more! Not familiar with BLINQ? BLINQ works with major retail partners to sell their excess, open box and refurbished inventory of top brands. They offer a huge selection of products like laptops, tools, kitchen appliances, toys, smartphones and more, all up to 70% off retail price! You will find brands like Apple, Samsung, Dell, Kenneth Cole, Calvin Klein, Disney and more-- the list goes on and on! Right now BLINQ has great prices on a lot of items that are perfect to gift to anyone in your family! Check out what we found and thought you would love! ~Calvin Klein Eternity for Women Eau De Parfum - 3.4 oz. BLINQ has got you covered and is ready to help make your holiday gift shopping a breeze! Head on over to check out all their great prices on gifts you'll love! They even have a gift guide to help give you suggestions! 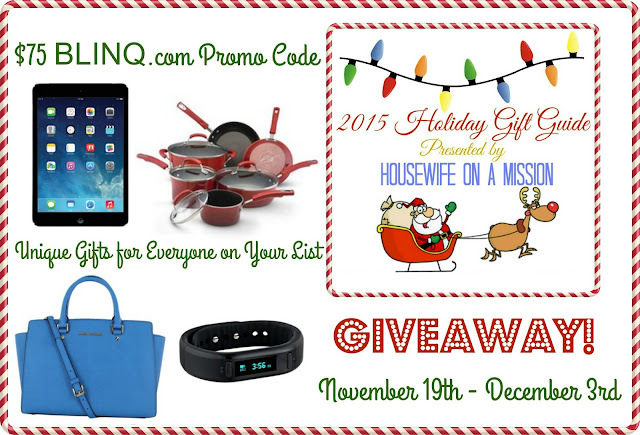 One of our readers are going to win a $75 promo code to BLINQ.com to help with their holiday gift shopping! I would buy the Chefman 8-Cup Food Processor. Emotion controlled cat ears, how fun! I would love the Ugg dakota slippers. It would be my splurge! I would love to buy the EatSmart Precision Elite Digital Kitchen Scale, because I am on a weight loss journey.. I would put it toward a new coat or boots for my son for Christmas. I would buy the Cannon Camera. Love to take pictures of my kids.. this would be awesome!! Thanks for the chance!!!!!!!!!! Michael Kors bag I have always wanted one.